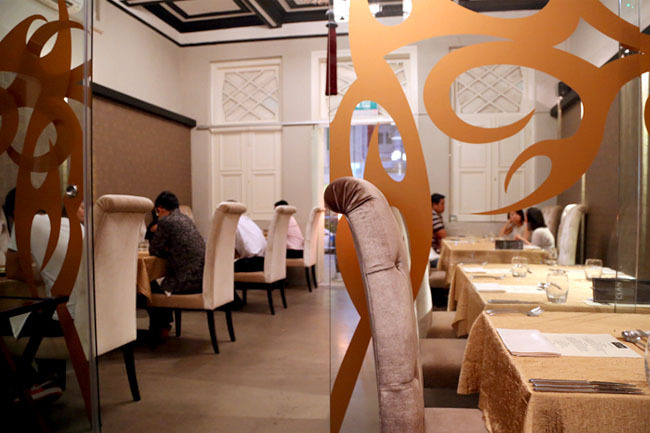 [Updated August 2015] The Clan Restaurant has moved to PoMo at Selegie Road. 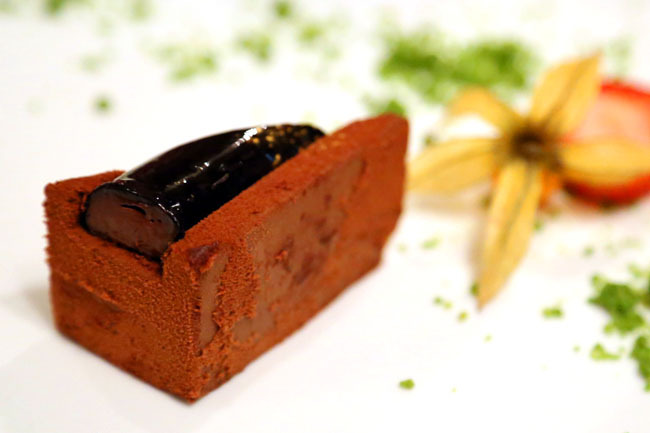 Updated review on The Clan Restaurant for more details. The waiter at The Clan Restaurant asked, “Are you single?” I was a little surprised because my question was what starters he would recommend. And I replied both of us are single. We nearly burst out laughing, but stopped in our tracks because the entire restaurant seemed a little quiet and tranquil, filled with romance in the air. With that said, this is one waiter who is candid, friendly, funny and very knowledgeable about the menu. Give him the ‘Funny Waiter of The Year’ award please. Before I go on, The Clan Restaurant is highly recommended. The 6 course degustation dinner menu is at $65.80++ (5 course lunch at $45.80++), and we are not even talking about some ordinary food. 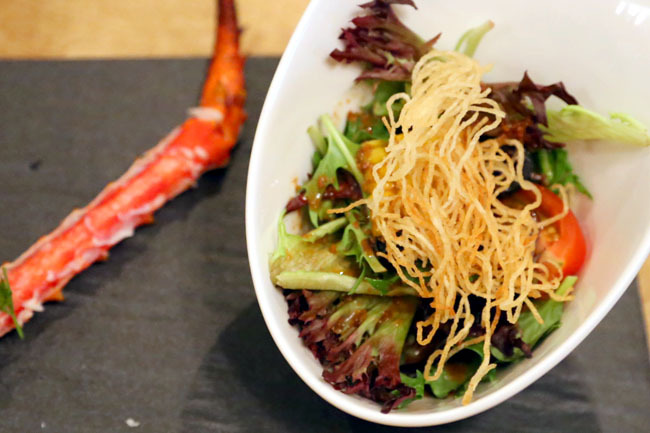 It is nestled in the conservation area of Bukit Pasoh, with an elegance décor, serving quite an elaborate menu of contemporary east-meets-west fusion cuisine, modern European dishes with Asian touches. 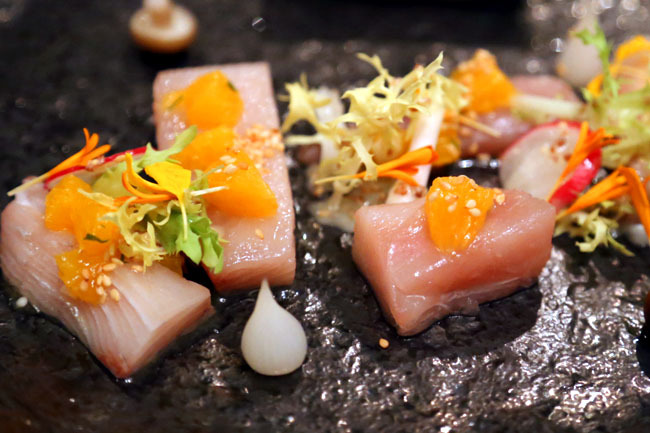 I had a New Style Sashimi, which is a re-invention of the usual Japanese raw fish, with Hamachi drizzled with Ponzu Sauce & Orange Salsa. Kind of refreshing and makes an enjoyable starter with the blend of tastes. 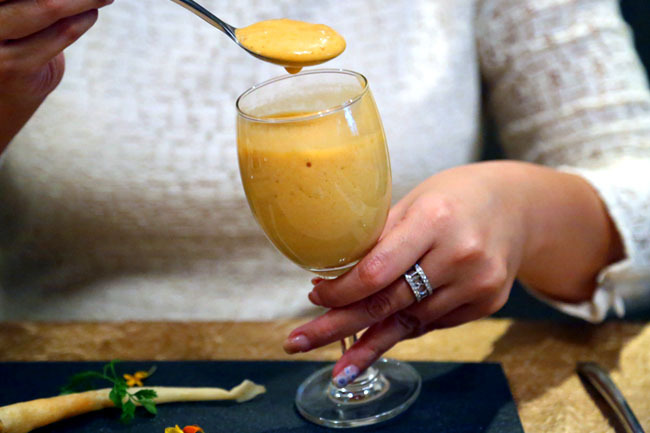 The Crab Bisque Cappuccino was served in a wine glass with a Prawn Twister, a rather frothy soup that strikes a smooth balance – not too seafoody, and not too light. The Clan’s Restaurant recommended main is the 48 Hours Beef Short Ribs served on top on Hoba Leaf with Pepperorn Sauce on a hot Lava Stone. 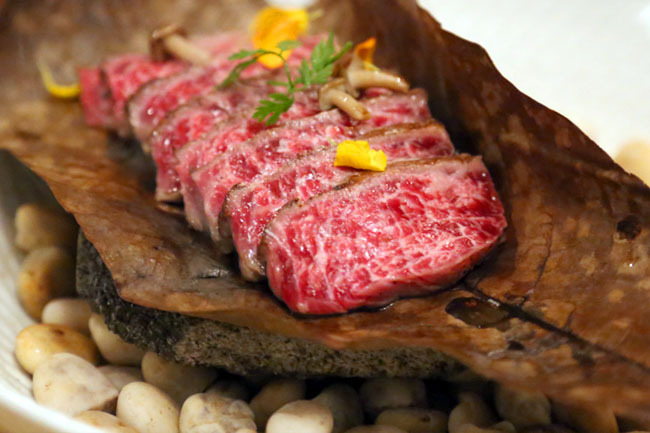 Presentation was not the usual hot plate, and you may find it a challenge not to overcook the beef on an ashy leaf and some slices could get stuck on the stone. (Yikes!) We both thought it was the sauce that saved this dish. 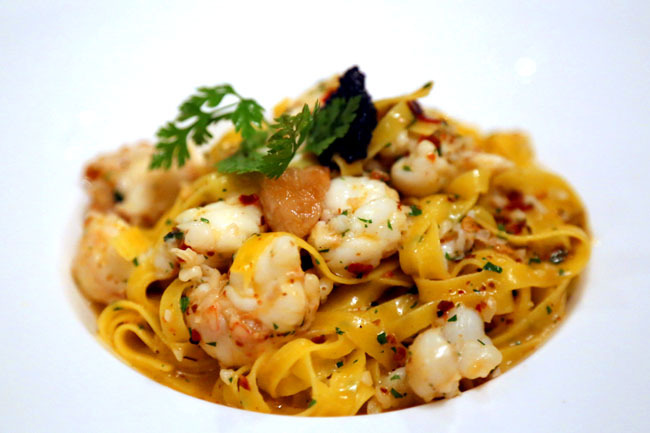 I thoroughly enjoyed the Lobster Crustacean Oil Pasta, one of the newer dishes on the menu – suitable al-dente-ness, generous servings of lobster, and the sauce not being overpowering. 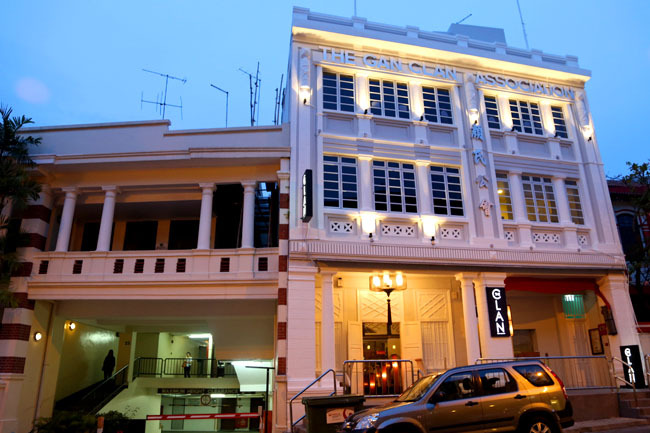 Having been to a few overpriced restaurants with disappointing food, The Clan Restaurant is indeed a fresh breath of air with its quality food, intimate ambience and attentive service. I know I have recommended a few date places, but this is really one respectable restaurant to have one of those birthday dinners with your husband/wife/boyfriend/girlfriend/prospective date/close friend. When I looked around, there must be at least 10 couples around, all dressed like they were attending their best prom night, 3 or 4 of whom were celebrating birthdays. I know because the sliced cake with candle keeps coming out. The table next to us was also celebrating a birthday. The girl (wife? girlfriend?) did not want to sing the birthday song to the guy (ohhhhh… …) and guess what, that same waiter who served us got down to sing it! Slightly awkward, but is this good service or what? 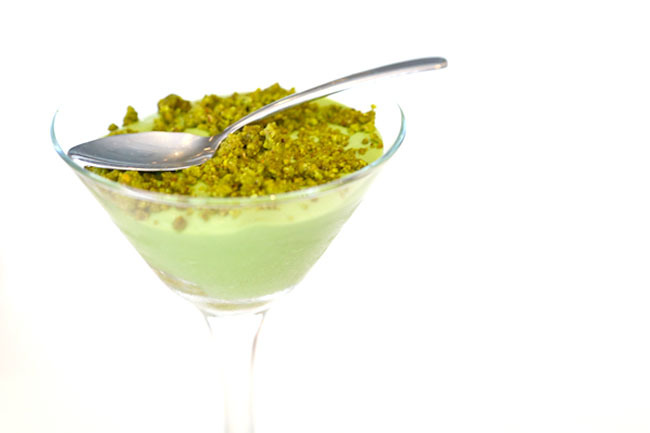 ← The Sleeping Rhino – Klapsons’ New Restaurant. Any Idea Why The Rhino Is Sleeping? I love the food at the Clan! this is very strange. The Clan people were from Dozo, but when my friends and I were at Dozo, the food was so-so. Later, after they went over to the Clan, we went to the Clan and although the food was similar, the Clan’s food was good! I guess working environment plays a part in food cooking.